The Bobcat Chronicle: Summer Time Awards! We just received word from the College Swim Coaches Association that our Men's and Women's team were honored as Scholar All-American Teams! As a whole last Spring the men's team received a 3.12 GPA while the women took home an amazing 3.46 GPA (13th in the country!). My records indicate that at this point Bates College Swimming and Diving has now received Scholar All-American status for 24 straight semesters! Twelve years in a row... wow. 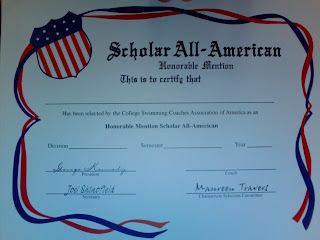 I also had the privilege this year of coaching three women that received Scholar All-American Certificates. A minimum 3.5 GPA and a national consideration performance qualifies you for this award. Only 6% of all college swimmers qualified for this award this year. The combination of being the best in the classroom and the pool is something very special... something very few can accomplish. Congratulation Ladies! Awesome, been gone for 3 months and the awards STILL keep coming! "The knee" still coming along. Started running! Here's to Bates Swimming 2011 Season... Work hard, SWIM FAST! Let me know when you have ideas for this years shirts! Congratulation to both teams. This is the mark if the real winners that you can train and compete at a very high level and still do well in class in a very competitive school. Keep up all the good work and fast swims.